After a Sunday night loss to the Los Angeles Lakers, the Cleveland Cavaliers sit at 9-30, owners of the second-worst record in the NBA and, outside of the transcendent Kyrie Irving, possessed of relatively little that's likely to stoke fans' interest. In the depths of a lost season, with all eyes on the future, many fans tend to rely on trade rumors to pass the time — if there's any chance of flipping an established veteran for younger, cheaper, more potential-laden pieces that could become foundational elements in a successful future rebuilding project, then, while it's not exactly thrilling, it's at least something. Any chance of the Cavs engaging in one of those kinds of moves before this February's trade deadline was likely all but scuttled last week, when the team announced that center Anderson Varejao would need surgery to repair a split muscle in his right leg, and that the recovery would keep him off the floor for as much as two more months. Prior to his injury, Varejao's fantastic two-way play and reasonable contract made him a top-tier trade chip for Cavaliers general manager Chris Grant; after his injury, the Cavs' most attractive available assets include Luke Walton's $6 million expiring contract and a chunk of salary cap space that could absorb a bad contract from a team seeking financial relief in exchange for, say, a first-round draft pick. [...] With the summer of 2014 quickly approaching, the length of a contract the Cavs will absorb is now limited. Executives and agents around the league are convinced the Cavaliers won’t do anything to jeopardize their ability to sign a free agent to a max contract during the summer of 2014, when LeBron James can again become a free agent. As fans in Northeast Ohio continue to howl and remain divided about the possibility of his return, more and more people around the league believe there is a strong possibility James will indeed return to Cleveland after next season. The Cavs are well aware of this, too, and won’t take on a bad contract if it compromises their cap space in two years. It's ridiculous to talk about where James will play in two seasons' time, but when the Cavs are included in the mix, it becomes the fun kind of ridiculous — not least of which because the rumored James/Cavs reunion has long been, as Scott Sargent of Cleveland blog Waiting for Next Year calls it, just about "the worst kept secret amongst NBA circles." It might not be as crazy as you'd think. The move is theoretically possible because James has an early termination option in his contract that he can exercise after next season to get out of the six-year, $109.8 million deal he signed with the Miami Heat during the summer of 2010. While it does seem sort of crazy that James would voluntarily walk away from making about $20.6 million in '14-'15 and just over $22.1 million in '15-'16 to play in Miami — and as Grantland's Zach Lowe pointed out last week in an analysis of Cleveland's post-Varejao-injury predicament, "there has been no on-record indication he has much interest in" opting out — it makes some long-term sense. If James were to opt out, it seems about as sure a bet as could exist in the NBA that a still-healthy, still-productive version of James — who will still be just 29 years old on Opening Day 2014 — would be coveted by any team with enough cap space to offer a full maximum-level contract. The Cavaliers are on target to be one of those chock-full-of-cap-space squads come the summer of 2014; at this point, the only guaranteed '14-'15 money on the Cavs' books is about $18 million earmarked for young building blocks Irving, Tristan Thompson, Dion Waiters and Tyler Zeller. Even assuming a long-term extension for Irving following the '13-'14 season, the Cavs will have more than enough space to be able to make the offer, as well as a bonafide star backcourt scorer and facilitator to pair with James, plus some potentially interesting secondary pieces to share the burden and enough room under the cap to add some veteran depth to the core. How attractive a roster Cleveland would have depends heavily on how the likes of Thompson, Waiters, Zeller and the Cavs' 2013 lottery pick develop over the course of the next two years, but provided the team's salary structure remains essentially the same, you'd expect the Cavs to be able to be in the mix. They're unlikely to be alone. Lloyd's story comes about three months after a preseason report that the Los Angeles Lakers could have designs on luring James to Hollywood to serve as their signature post-Kobe Bryant star and primary scorer. At least a handful of other teams figure to be able to carve out max-salary cap space for '14-'15; given the opportunity to pay as much as they could for the consensus best player in the world, one would figure they'd jump at the opportunity. James can’t opt out of his contract until after the 2013-2014 season, but he understands that the Cavaliers would have to make a decision to hold back on their rebuild, preserve cap space, and wait on him all over again. He has to convince Gilbert to make the leap of faith, and that includes first working over the fans. Of his return, James said: “I think it would be great. It would be fun to play in front of these fans again. I had a lot fun times in my seven years here. 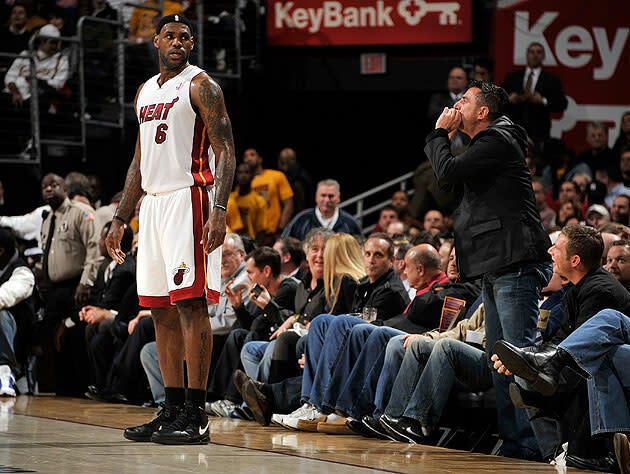 … I’m here as a Miami Heat player, and I’m happy where I am now, but I don’t rule that out in no sense. That, of course, would be the $64,000 question. 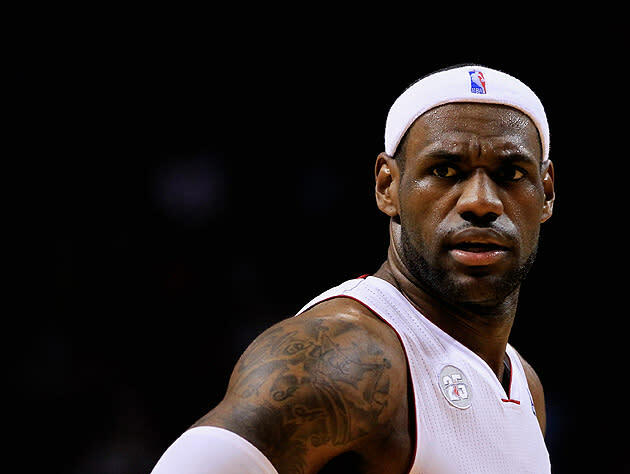 Could Cleveland fans accept LeBron James back into the wine and gold? Yes, the summer of 2010's a long way in the past and Cavaliers fans have since turned to Irving as their favorite son, and yes, James' national reputation has undergone a major rehabilitation following a remarkable year that saw him win not only a third NBA MVP, but also an NBA title, NBA Finals MVP and Olympic gold medal with Team USA. But after the psychodrama of "The Decision" and its aftermath — after all the losing that followed it and the relative lack of hope that's clung to the Cavaliers franchise since LeBron headed south — it still seems like a massive leap of faith to suggest that owner Dan Gilbert and Cleveland fans at large would be able to get right with a return. Then again, the prospect of having the best player in the world again and the Cavs returning to relevance could prove to be pretty enticing for a fan base that hasn't even sniffed the playoffs since James left. And as CBSSports.com's Zach Harper notes, the potential redemption story of LeBron healing past wounds by fulfilling the promise of his youth and bringing a title to his home state is almost too good a narrative to be true. If Lloyd's right, and Grant and company are determined to make an honest-to-goodness run at James, we might just get a chance to find out how a script like that ends.